He heard the messenger slide the black envelope under the door during the night, but he ignored it. An exercise in discipline. Sun fought against charcoal clouds through the window of the Marylebone flat as a scowling Michael North emerged from the bedroom. His head pounded. He ran through in his mind the fight a week earlier: several sledgehammer punches to his temple and jaw before he closed the guy down. Not clever bearing in mind his situation. And it was too bright in here. He pressed a button and the Venetian blind slid halfway down the glass. For a split second, he glimpsed a figure on the street gazing up at the building, but the falling wooden slats moved too quickly and, when he checked again, the figure had gone. He popped the blister packet he pulled from his back pocket, chewing the two purple tablets en route to the kitchen, the taste bitter on his tongue. He didn’t know what was in them – the Harley Street medic prescribed them. “In the circumstances, Michael…” that is to say “bearing in mind you’ll be dead soon, you can have these experimental drugs”. He didn’t ask the medics questions but sometimes they told him anyway. Things like “Watch for an escalation in the insomnia and migraines or any obsessive behaviours – that may well mean the bullet has shifted”. And when the bullet in his brain shifted, he didn’t need anyone telling him – he was a dead man. He was shot on patrol outside Lashkar Gah in southern Afghanistan five years ago. The sniper made his own ammunition and the doctors told him he was “freakishly lucky” in the bullet’s trajectory and position – just short of the posterior parietal artery in the right temporo-parietal junction. North didn’t feel lucky. Neurosurgeons removed fragments of bone but couldn’t extract the bullet without further catastrophic damage. They were sorry. Instead they induced a three-month-long coma and let the inflammation of the brain subside. Would he like them to operate again? He’d said no but he often thought he should have said yes. Because what the doctors didn’t know was that he suspected the bullet was driving him mad. On the upside, there was as yet no sign of the loss of cognitive and motor decline they warned him of. And he doubted he would live long enough for the epilepsy and dementia to kill him. On the downside, the bullet affected his brain processing – new neural pathways establishing themselves, heightening his intuition when it came to other people, a sixth sense so to speak. At least that’s how he rationalised it when he left the hospital and did the research. Neuroplasticity it was called. The brain’s ability to heal and to compensate. He trawled through academic papers, medical journals and books he barely understood till it didn’t frighten him. Till he could make himself believe it was possible, probable even. Till he could comfort himself that he was as normal as the next person. Though the next person didn’t have a bullet in the brain. Judith O'Reilly is the author of Wife in the North, a top-three Sunday Times bestseller and BBC Radio 4 Book of the Week. 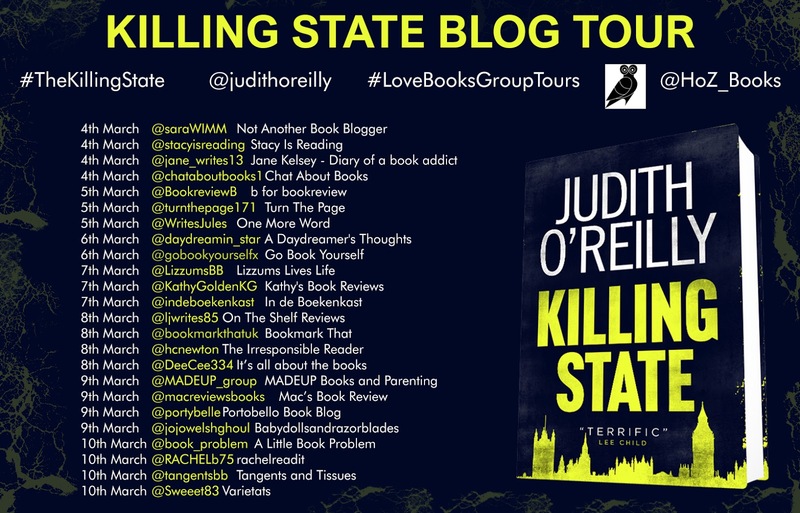 Judith is a former political producer with BBC 2's Newsnight and ITN's Channel 4 News, and, when she isn't writing novels, she writes for The Sunday Times. Judith lives in Durham.